This leg shroud is an add-on part for Safariland duty holsters allowing transition from hip carry to thigh carry. 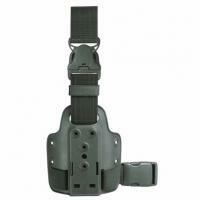 It features a 2 inch single elastic strap and a quick release buckle with 2 inch strap which attaches to the belt. Its small size allows for a lower profile carry and it is constructed of injection molded nylon for durability and flexibility. It features mounting holes for attachment of three Safariland tactical accessories or one holster with two accessories.